Mountain Horticultural Crops Research Station was established on 14 acres in 1949 and is now 377 acres. Its growth and expansion is based on the station’s success as becoming a leader in laboratory, greenhouse and field studies vitally important to North Carolina’s economy. MHCRS has a varied topography and climate with land conducive to crop research and evaluation of cultural practices of the region. MHCRS is located in the Southern Appalachians in the French Broad River basin with a base elevation of 2,069 feet. 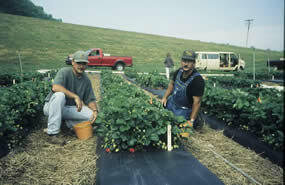 The adjacent Mountain Horticultural Crops Research and Extension Center serves as the office and laboratory headquarters for resident research and N.C. Cooperative Extension Service. MHCRS requires a large complex of structures, buildings and land to conduct its research program. Twenty-seven indoor and outdoor structures covering more than an acre are used to grow seedlings and maintain plants for field research. There are 16 buildings used to store and work on equipment, collect data, provide utilities and service to the station. A touch-and smell herb garden, ornamental display gardens and arboretum are also located on the station grounds. During the summer, as many as 100 people can be found working on 77 research projects. There are 14 MHCRS staff in addition to 13 faculty and 27 support staff at MHCREC. Mountain Horticultural Crops Research Station participates with food banks and gleaning programs providing more than 100,000 pounds of produce to those in need over the past three years. To save on costs and as a societal benefit the station participates in the Governor’s Community Work Program providing free labor from Correctional Centers. The on-site Wastewater Demonstration Facility acts as a major training area for agents, specialists, installers and operators promoting the use of the most appropriate technologies for a given site. MHCREC hosts numerous agricultural and community meetings throughout the year at its meeting facilities. The station hosts numerous tours, workshops and field days. The Fresh Market Tomato and Vegetable Field Day is held annually on the station. The Apple and Peach Field Day and Nursery and Landscape Field Day are held every other year. 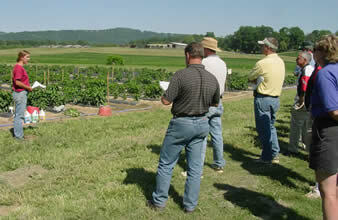 The research program provides tours for growers, Master Gardeners, schools, professionals, businesses and the public. Questions/comments about the Research Stations Division?